together with some general observations on Moths in Britain. Moths, together with butterflies, make up the insect group known as Lepidoptera. With around 2,500 species of moths in Britain (contrasting with approximately 60 species of butterflies), identifying individual species can be a fairly specialist task! 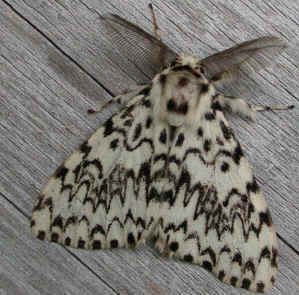 Of the 2400 moths, roughly 800 species are classed as 'Macrolepidoptera'. 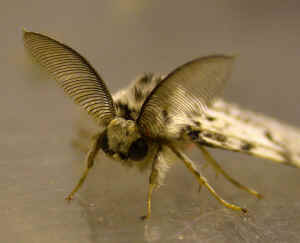 The remainder are classed as 'Microlepidoptera, or micro moths. This latter group, as their name suggests are usually, although not always, much smaller than the Macrolepidoptera and are considered to have more primitive characteristics. Identifying micro moths may be a fairly challenging task, but many of the Macrolepidoptera are sufficiently large and distinctive enough for anyone with enthusiasm and a keen eye to be able to identify. 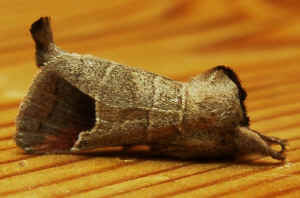 Size: Adult moths (as with all insects) are already full size and do not grow after emerging. Therefore, although there may be some variation in size within a species, all species have a fairly narrow characteristic size range. 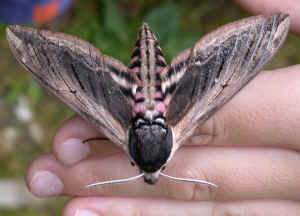 Moth species in Britain range in size from Hawk-moths, which may have a maximum wingspan of 3-4 inches, (Privet Hawk-moth left), to minute micro moths, which can require the use of a hand lens to view properly. Wing Shape: This can be important in identification. 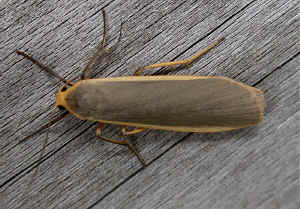 For example, the Common Footman (left) and Dingy Footman, which look otherwise quite similar to each other, can be separated on the basis of the shape of the leading edge of the forewing. Wing Patterns: All moths have wings covered in scales. For each species, the arrangement and colour of thousands of individual overlapping scales gives rise to distinctive colours and patterns on the wings. These are extensively used in moth identification (Black Arches left). The scales are only loosely attached and may come off if the moth is roughly handled or with the general wear and tear of living. The older a moth is, the less pristine it will be and the more scales it will have lost. Older specimens can therefore be more difficult to identify. 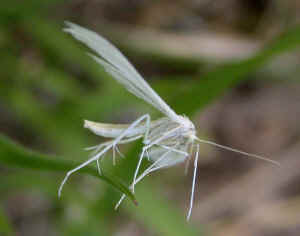 Legs: Identifying plume moths similar to the White Plume Moth (left), may involve counting the number and arrangement of the spurs on the legs. Colour may also help. Although they are not easy to see when the moth is at rest, the Ruby Tiger has bright red legs. Antennae: Male moths can be distinguished from females by their comparatively feathery antennae (left). These are acute sense organs which can detect female pheromones on the air from astonishing distances. Some moth species such as Feathered Beauty and Willow Beauty, which look similar and can be confused, can be separated by differences in the antennae of the males. Behaviour: Characteristic ways of flying and of sitting at rest, can also help to identify moth species. The Chocolate Tip (left) sits in an unmistakable pose. Genitalia: With some adult moths, the differences may be so obscure that the only way to separate them out is to dissect out the genitalia and look at them under a microscope. This is obviously not for the lay person and also requires the moth to be killed to be identified.